(Nanowerk News) How can one increase the maximum current which can flow in a superconductor without any resistance? Counter-intuitively the answer in some circumstances is to increase the dissipation (i.e. the energy losses) in the superconductor, as Paul Warburton and his colleagues from LCN and the University of Oxford show ("Dissipative Enhancement of the Supercurrent in Tl2Ba2CaCu2O8 Intrinsic Josephson Junctions"). 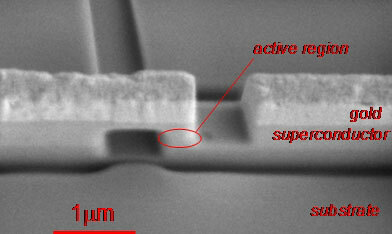 SEM image of an array of ~ 100 intrinsic Josephson junctions in a thin film of an oxide high-temperature superconductor. Each Josephson junction is 1.7 nm thick, so cannot be individually resolved in this image. The structure was fabricated using focussed-ion-beam milling. Small currents can flow in superconductors with absolutely no resistance. This makes them important for a number of applications including hospital MRI scanners and energy-efficient power transmission. But above some value (known as the critical current) a phenomenon known as phase-slip causes a resistance to appear. Experiments on nanostructured thin films of the high-temperature superconductor thallium barium calcium copper oxide (TBCCO) conducted by Dr Warburton and his colleagues show that increasing the dissipation (or the viscosity) suppresses phase-slip, allowing larger currents to flow with zero resistance. This is one example of how viscosity can prevent transitions (in the broadest sense of the word) from happening. In this case the transition is from the zero-resistance state of a superconductor to its resistive state. But both the natural and man-made worlds abound with examples of other types of transition where viscosity plays an important role. For instance, in the financial sector transitions between periods of steady growth of stock market prices and periods of wild fluctuations can be suppressed by “viscosity” in the form of market regulation.